This fall, California’s Disneyland Resort and Disney’s Hollywood Studios in Florida will launch Star Wars: Galaxy’s Edge. 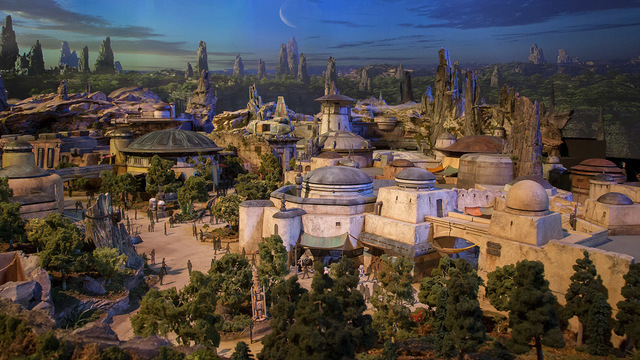 These parks invite Star Wars fans to visit Black Spire Outpost on the Outer Rim planet of Batuu. Ahead of the attractions’ respective openings, Disney and Lucasfilm are fleshing out the lore of this cosmic region. According to StarWars.com, Del Rey and Disney Lucasfilm Press are releasing three new novels that expand on Batuu’s history. We already knew that Marvel was preparing for Galaxy’s Edge by releasing an eponymous comic book miniseries of the same name. That series will introduce readers to an Ithorian named Dok-Ondar, a morally ambiguous antiquities dealer. Following this, Disney Lucasfilm Press will publish two young adult novels, A Crash of Fate and Star Wars: Myths & Fables, on August 6. A Crash of Fate is written by Zoraida Córdova and tells the story of best friends Izzy and Jules, who lived together on Batuu as children. After spending several years away, Izzy returns to Batuu and draws Jules into a plot involving smugglers and pirates. George Mann is writing Myths & Fables, which also features artwork by Grant Griffin. As its title implies, the book includes a number of folktales set in the Outer Rim. To tease the collection, StarWars.com posted an excerpt from a story titled “The Knight & the Dragon.” You can read the excerpt at the link above. On September 3, Del Rey will release Delilah S. Dawson’s Black Spire, a prequel to the upcoming Galaxy’s Edge attractions. The novel depicts General Leia Organa sending her most trusted spy to enlist new recruits to join the Resistance. IDW Publishing has its own Galaxy’s Edge children’s comic in the works. Surprisingly, Insight Editions is also putting together a Star Wars-themed cookbook written by Chelsea Monroe-Cassel and Marc Sumerak. Monroe-Cassel previously wrote cookbooks inspired by Game of Thrones and World of Warcraft. What are your thoughts on these upcoming Star Wars: Galaxy’s Edge tie-in books? Let us know in the comment section below!